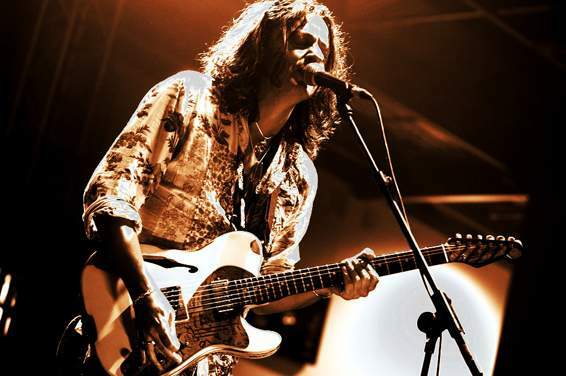 In the first part of our interview with guitarist extraordinaire, Dave Kilminster, we spoke of his solo album, "Scarlet", and some instrumental angles. This part, in its turn, sees us talk Dave’s famous taskmasters and more. – Dave, what does it say about your personality, about your ability to fit in any configuration of a band when working with famous artists? That’s a good question, actually, because a lot of times, when you get to a certain level, it’s almost like the musicianship doesn’t really matter – it’s how you are as a person. Everyone on the tours with Roger – and I mean everyone: the band, the crew, the technicians – they’re all the nicest people you could ever wish to meet. All are very even-tempered, no drinking problems, no drug problems, no depression or anything like that. You have to be easygoing, it’s a very important thing. Which I guess I am. – And when you played with John Wetton he wasn’t in the best of shapes. Yes, you’re right. (Laughs.) That was my first ever big tour, with John. To be honest, if I started to work with someone like that now, then I would just say, “Look, no, forget it. I’m not doing it”. But at the time I didn’t know then what I know now: my experience has taught me that I wouldn’t put myself in that situation again, because it’s not fair to anyone. We did some shows that we shouldn’t have done, and I felt like we cheated the audience a little bit. – The first album I heard you play on was Wetton’s "Nomansland". What struck me the most about it was that you, while being faithful to the songs’ spirit, never reproduced the parts of Steve Howe, Robert Fripp and Allan Holdsworth. How do find this golden line between being yourself and serving a piece? – Yet with Waters you’re not allowed to bring your own personality into PINK FLOYD’s songs at all. – Was there a directive from Roger or was it you who decided to do it like that? A bit of both, really. PINK FLOYD fans tend to be very, very fussy: if they didn’t like me, they would let me know. (Laughs.) Roger views his albums more like classical pieces – they’re not something you can play around with. It’s almost like I’m performing “The Four Seasons” by Vivaldi: halfway though it you’re not going to start some crazy tapping thing – people want to hear something that resembles the original music. And Roger was responsible for the whole package, for the whole picture of PINK FLOYD, that’s what he likes. There’s not really any room for improvising, he wants to put on the best show possible. And obviously, in other situations, sometimes you can improvise, and some nights it’s really good, and some nights it would be terrible. When people pay a lot of money – and Roger’s tour is very expensive to go and see – they want the best show, so we’re trying to do that. And to me, the best show possible is just to play what’s on the album and to try to make it sound as good as possible. – At one point, you almost joined another great band, ASIA. I remember their reunion site with you as ASIA’s new guitarist alongside John Wetton, Geoff Downes and Carl Palmer. Why did it fall apart? Um, I’m not exactly sure. I think… (Long pause.) No, to be honest, I’m not completely sure. After that, I went to play with John Wetton and Carl Palmer, and we did the QANGO thing, so I’m assuming that Geoff either didn’t want to do it or was committed to do something else. But it wasn’t anything to do with me, let’s put it that way. John and Carl were very keen to do it at the time. – How did you get into their orbit? Through Guthrie Govan who played with ASIA? No, no, not at all, no. I met John Wetton in ’97, I think, and I met his manager, too. And his manager has subsequently become my manager as well. – You mean Martin Darvill? (Laughs.) Yes, and Martin Turner [WISHBONE ASH]. A lot of people. Martin’s been one of my best friends since ’98-’99, I guess, so it’s a long time, and I actually live very close to him. – So it was him who recommended you to John? No, I met Martin through John Wetton. But originally I met John because his bass tech Carla, was the daughter of someone I used to teach. – Cherchez la femme, eh? (Laughs.) Exactly. So she came up to me one day and said, “Oh, I don’t know if you heard of this guy, he’s looking for a guitarist. His name is John Wetton”. And I said, “What, John Wetton from U.K. and ASIA and KING CRIMSON?” She said, “Yeah, that’s him”. I’m like, “OK, sounds great”. That was pure luck that I was teaching her father how to play guitar at the time. She was at school, and I don’t know how she heard of me; perhaps, her father was saying nice things about me. That’s how I got that gig. – You seem to have a special connection with Wetton. You came and went and played with QANGO and came back for John and Geoff’s ICON. Well, he wanted to do the ICON thing because he’d stopped drinking and he wanted to do something with me and my friend Pete [Riley], and just to do it properly. So we did the “iCon” album together. – Another side of that special connection is that both you and John are left-handed but play with a right hand. – Yeah, and he had an album, "Sinister", acknowledging his left-handedness. – Let’s ask Tony Iommi about that! Exactly. If you’re naturally left-handed, then you would play with your right hand on the guitar, which is the weaker hand. And there was a couple of guitarists – Gary Moore and Mark Knopfler – who were both left-handed, and they both played right-handed. But I think that’s it’s a good thing, because your strong hand is on the guitar neck. I did use to play left-handed but I had very bad problems with my wrist. I’m glad I swapped over, to be honest. – How different it was, playing with ICON as opposed to Wetton’s band. – And you played live with ICON as well. I have this official bootleg of their concert, where you get to play “Angel” from “Scarlet”. Yeah, John very kindly let me play that in the set, but I didn’t really want any of that stuff recorded, because we weren’t… John hates rehearsing. And Geoff hates rehearsing. (Laughs.) So I just felt that we were very unrehearsed. And that’s a shame: we could have been a really good band. The first time I ever played with John, the first tour I ever did in ’97, we had two days of rehearsal, which is not enough for two-hours worth of music. – Recently, I saw HEEP rehearse vocal harmonies with John Jowitt, for the first time, just half an hour before the show, and he’d played with them for the first time only two days before – for quite a long set. – Well, THE NICE always sounded a bit rough, so that shouldn’t have been a problem. – You took the word right out my mouth! And you played with another keyboard player, Ken Hensley. To me, that looked as if Wetton had lent you to Hensley. Martin did that, actually, Martin Darvill, because Martin was looking after Ken Hensley. So I did the tour and the album as a favor to Martin. – I know you’re not happy about the financial side of all this, but what you did on “I Don’t Wanna Wait” augmented the song significantly. I know the original demo of it, but the acoustic layer that you brought in, complemented it nicely. – But were you on equal footing as part of QANGO? QANGO was a little looser, because John Young was also writing tunes and had written some stuff in the past for John Wetton. 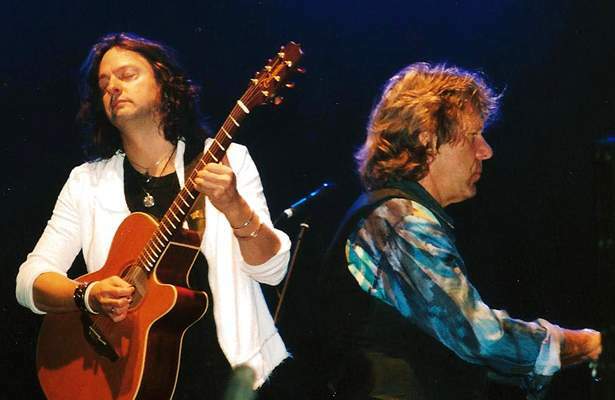 So it felt like a bit more of a collaborative effort, but John [Wetton] wasn’t well at that time – he was drinking while we were doing the QANGO gigs – and you could just tell that it wasn’t going to go very far. – Did you ever make it into the studio or it was only a live situation? Uh, just live. We recorded that live album, but on the second or third gig of the tour John lost his voice completely, because he’d been up drinking the previous night. It was all very depressing. – So you proceeded to work with Keith Emerson? Yes. Keith was in the audience at a QANGO gig that we played in London, and at the time he wanted to join the band with me and Carl and John, which would have been, pffft – wow! It would have been amazing! – You played with Emerson and Palmer, so what about playing with Greg Lake? Would you like it? (Laughs.) Well, Martin is looking after Greg as well, so… But it wouldn’t make sense, because I’m trying to play guitar and sing, and that’s what Greg does. – But he had Gary Moore in his band, so why not? That’s true, that’s true, yeah. I really liked that album [“Greg Lake”] when it came out. But I feel like I’m at the stage where I need to be recording my own music before it’s too late. – Still, you found time to transcribe the pieces by Michael Schenker, Steve Vai and, of all things, COLDPLAY! (Long laughter.) OK, what can I say? I have to make a living. – And you were teaching. Where do you find the discipline to be a teacher? I think it’s mostly patience, really, and I have a lot of patience. If I dedicate myself to something, I can concentrate for a very, very long time, like I used to do when I was learning how to play guitar. I would sit with my record player and just figure out what was going on. I’d have my guitar in one hand and the record needle in the other hand, and I’d move it and find the bit that I wanted, and I played it again. Then move the needle and play it again. I would sit for hours doing that. – And when you write, what do you prefer – an acoustic guitar or the electric one? Most of the writing for my new album has been done on an acoustic guitar. But that’s just because I never plug in my electric guitar at home, and when it’s unplugged it doesn’t sound very inspiring. So I got my old Martin [guitar] out and I actually found a new tuning as well, which I really like, so I’ve been experimenting with that and recording so many ideas since I’ve got back from tour. Maybe I was frustrated at playing other people’s music all the time (laughs) when I had all this music inside. I’ve got enough [songs] for two albums at the moment, I’m going to record one next month: we’ll see how it gets on, and maybe I’ll do another one later on this year. So it’s generally acoustic – or even piano: a couple of the tunes on “Scarlet” I wrote on piano. (Laughs.) Yeah, it is. It’s huge. I can’t imagine getting a bigger gig than this. I don’t think there is a bigger gig for someone like me. If I had to go and try and get to the next step and get higher, I don’t think there is anywhere. It is definitely the peak of my career, and it’s been seven years now that I’ve been playing with Roger. We started in 2006 and we have some more shows this year: in July, August and September. I can’t get any higher, but I’m going to have to go on a detour to do my own music. I’ve been very lucky, I’ve played with some amazing musicians. I really have. – Is there anyone else you’d like to work with? (Pauses for thought.) I can’t think of anyone. I love doing projects, I love working with other people, and I did miss out a while ago. I saw Steven Wilson [at the Royal Festival Hall)] last night, and he’d asked if I could do a tour with him back in 2011 – which would have been great, because I really like his band, you know, with Nick Beggs on bass and Marco Minnemann on drums: wow! That would have been fun, I would have loved to have done that tour, but I couldn’t. – Having a guy in a skirt on stage is surely fun. – Back to you. What the title of your new album will be?